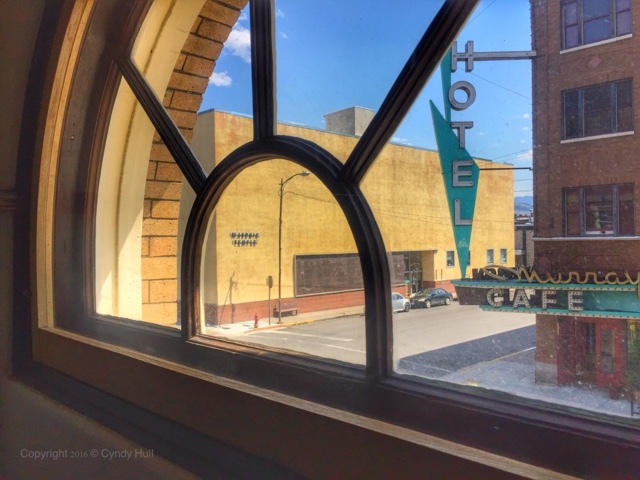 The view from inside one iconic building out to another: the Livingston Depot's stairwell window looks out to The Murray Hotel and sunny downtown Livingston. From Memorial Day to Labour Day, the depot is home to the fascinating railroad memorabilia of The Depot Center Museum. We spent the hottest part of Sunday afternoon browsing through the heyday of passenger train traffic through Livingston, which for many years was the hopping-on point for tourist trains to Yellowstone National Park. A short trek upstairs brings you to a display of movies shot in or near Livingston, from black-and-white era Westerns to the 2016 drama "Certain Women", with a fair selection of foreign films and comedies in between. Oh, and let's not forget "A River Runs Through It". The museum was one highlight in a lovely summer afternoon, and definitely merits a return visit.